Click here for copy of information contained in this chapter!!! First may I thank you for the phone call -- & here was me thinking it was some sales type on the blower - I nearly didn't answer as by now I am thoroughly teed off with that sort of thing. A pleasant surprise, indeed. Enclosed are photostats of a couple of things you may find interesting. My pal that I mentioed before who worked on the castle passed them on to me a while back -- the map I mentioned already & now it turned up. I've left the part copied separate as I know in cases like these where there is not a full copy some folk prefer things left separate. One of these days I'll get down to the map library & see if they can do me one piece & I daresay they'll take a copy for themselves as they have not got a copy of this version as far as I know. The other two sheets are more or less self explanatory --- I don't have any more like these - mores the pity. Well, that's about it for the present. P.S. Found something else -- an article my Dad copied out of Scots Magazine back in the early 70's. The motto at the end I would guess translates as "But secure." PPS. My my, how time flies - 'tis now May 9th! I'll get this off today. Click here for "Duffus Castle - Remedial Work"
One of the best examples of a 12th-century motte and bailey castle in Scotland, Duffus Castle consists of an extensive outer bailey with a wet moat, a walled and ditched inner bailey, and a large motte. On the motte was built a square 14th-century stone keep, part of which has collapsed down the slope. The original castle was built by Freskin, Lord of Strathbrock. David I stayed here while supervising the construction of nearby Kinloss Abbey. Duffus was destroyed by the Scots in 1297, but was rebuilt in stone by the Cheynes in the 14th century. It passed by marriage to the Sutherland Lord Duffus in 1350, and the family held the property until 1843. The castle was sacked in 1452 by the Douglas Earl of Moray, and again in 1645 by Royalists. John Graham of Claverhouse, 'Bonnie' Dundee' stayed here in 1689. The castle was abandoned for nearby Duffus House, at the end of the 17th century, and became ruinous. One of the oldest castles in Scotland, Castle of Old Wick consists of a simple square keep standing on a promontory on cliffs above the sea, cut off by a ditch. It was built in the 12th century when this part of Scotland was ruled from Orkney by the Norsemen, possibly by Harold Maddadson, Earl of Caithness, who was blinded and castrated by Alexander II. It was a property of the Cheynes in the 14th century, then the Oliphants, before passing to the Dunbars of Hempriggs, then the Sutherland Lord Duffus. In 1569, during a feud with the Sinclairs, the castle was besieged, starved into submission, and captured by John Sinclair, Master of Caithness. It was sold to the Sinclairs in 1606. Adair Duffus Mulligan recently published the six-volume Connecticut River Corridor Management Plan, culminating five years and work with the citizens of VT and NH. She is a single mother of three children, ages 16, 13, and 9. Adair enjoys canoeing, mountain climbing, and kayaking. Webmaster note: Adair has been added to the Duffus Authors page!!! Kathleen Duffus worked at a Boston financial services company for eight years, starting at an entry level position and advancing to controller of the brokerage division. She resigned in December of 1998 to take her current position at the Alzheimer’s Association of Eastern Massachusetts. In 1991, at age 56, Ms. Duffus’ father, Donald A. Duffus Sr., was diagnosed with Alzheimer’s disease. Alzheimer’s is a progressive, degenerative disease that attacks the brain and results in impaired memory, thinking, and behavior. For the next eight years, Ms. Duffus was one of her father’s primary caregivers. This role was both emotionally painful and time-consuming, as her father lived an hour and a half away. Some of her responsibilities involved choosing an appropriate adult day health program and later a nursing home for him; meeting with nursing home staff; attending to his finances; taking him to doctor’s appointments; going to court to be appointed his co-guardian; and providing regular one-on-one care. Balancing her work with caring for her father proved difficult. There were many times when Ms. Duffus needed to take leave from her job at the financial services company to care for her father. Ms. Duffus was aware of the unpaid leave guaranteed her by the Family and Medical Leave Act (FMLA), although it was not widely discussed at her workplace. However, as a single woman living alone, she depended on her salary and could not afford to take the unpaid leave the FMLA offered. From the time of her father’s diagnosis in 1991 until his death in March 1998, Ms. Duffus was forced to limit her leave to her vacation time, approximately three weeks every year, to care for her father. Although Ms. Duffus is grateful that her vacation time allowed her to care for her father, and also that her company gave her some flexibility, she feels that if paid family and medical leave had been available to her, it would have allowed her to take better care of both herself and her father. "During the time when my dad was sick, which was over a period of eight years, I had a lot of responsibilities and demands put upon me from both family and work. A lot of this time I felt like I was in crisis mode, working in overdrive, and struggling with being so far away from my dad. It definitely took a toll on me. Paid family and medical leave would have allowed me to plan a little better for things, and it also would have given me more time with my dad," said Ms. Duffus. "Paid family and medical leave is a win-win situation. It helps out the caregiver, which in turn helps out the businesses, as the person can be more productive when he or she is at work." Ms. Duffus can be reached through the Alzheimer’s Association of Eastern Massachusetts at (617) 868-6718. CHARLOTTESVILLE, Va., May 11, 2000 (BUSINESS WIRE) -- Fifteen student entrepreneurs refining nine business concepts will inaugurate the The Darden School's Progressive Incubator(TM) this summer. The Progressive Incubator(TM), part of the Batten Institute, will provide support and advice to participants as they work to mature their ideas and secure venture capital. Among the 13 Darden MBA students are Robert Moreland, Timothy Plankey, Girard Ruddick, Brian Lacey, Christopher Duffus, Clifford Miller, Stephen Maiden, Jaun Ortiz, Marco Vega, Kareen Looi, Erik Thoresen, Jeremy Webber, and Gregory Sonzogni. Also included are two University of Virginia graduate students: Michael Smoot and Supriya Jaiswal. Incubator(TM) makes it possible to pursue a top notch MBA and to start your own business at the same time. The support you receive at Darden from the program, the faculty, and the other students makes the program an incredible resource. I have the ability to put together a business that could be much larger in scale and scope than I would have been able to do before coming to Darden." These teams earned their spot with the incubator through entering either Darden's annual Business Concept Competition or Business Plan Competition. Each venture will be afforded office space and supplies, access to venture capital funding and advice, and a stipend during the summer. Robert L. Carraway, Associate Professor of Business Administration and Faculty Director for the Progressive Incubator*, will provide counsel to the participants and will act as a liaison to the other members of the faculty. Separately, an outside expert Review Panel will monitor the progress of each venture as it moves through various stages of development. "Unlike most incubators, the ventures in our program originate entirely with the students," says Wendell E. Dunn III, Director of the Batten Institute. "Our program is a continuing educational process, not just an incubator. We're interested in student learning as much as student commercial success." Dunn, however, emphasized that to remain in the incubator, student ventures must meet the market challenge at every stage. "Darden supports the ventures but doesn't invest directly. That's the market's function," Dunn added. The participants will begin working later this month in the Career Development offices at Darden. In June, they will move to a 2,000 square-foot space at 300 West Main in Charlottesville. Toward the end of the summer, participants also will have the option of working at the Batten Institute's new Northern Virginia location in Reston Town Center-the heart of Virginia's high-tech corridor. "I view the incubator as a low-risk way to pursue the high-risk path of entrepreneurship," says Stephen E. Maiden, First Year student and CEO of Reemba.com, one of the Progressive Incubator's ventures. "Regarding Reemba.com, our three founders probably would not have continued pursuit of our venture without the structured support offered by the incubator. Furthermore, the instant credibility we have gained with venture capital companies because of our participation in this program has been helpful." The Batten Institute created the Progressive Incubator(TM) to fulfill part of Frank Batten Sr.'s vision for Darden. In an announcement last December that accompanied his $60 million gift to Darden, Batten said, "For several years, I have been thinking about what we could do to have a significant impact on business leadership and performance-here in Virginia and in the nation. I concluded that a great opportunity to make a difference is to develop at Darden a world-class program in entrepreneurship." Batten is the retired chairman of Landmark Communications and founder of The Weather Channel. His gift is the largest ever made to a business school. George Duffus of Banff tree updated. 11. HAROLD AMBROSE (BOLIVER)4 DUFFUS (JAMES FRANCIS3, JAMES2, GEORGE1). He married MARY OLIVER SCHMITT (OR SMITH). Fact 1: Married three times and had four children. i.MICHAEL PETER DUFFUS5 SUMMERS, b. 1960, Melbourne, Australia. I hope you don't mind me using your first name as I feel I know you quite well after reading all the internet correspondence which my son passes on to me . I must however apologise for not having replied to your letter of April last year which gave advance notice of the reunion at Duffus castle at the end of June. Since then I have been kept up to date by your various mail shots which my son receives on his computer -- I am afraid I don't possess one. Perhaps a few facts might be of interest to you for your data base. My full name is William Alexander Duffus and I am 72 years of age. I'm married to Sybil and we have a son John Alexander and a daughter Heather Anne together with four grandchildren. For a number of years I have been interested in constructing a family tree and I have got back as far as 1761. My earliest traceable ancestor was one William Duffus a farmer of Pennyburn. Unfortunately, as you probably know, records in Scotland are not as complete or concise as they might be and if one does not have easy access to the records in Edinburgh, research is made more difficult. I still have relatives --- cousins living in Tomintoul and Aberdeenshire together with two others in Australia. My wife and I intend to be at the re-union and also wish to participate in the various visits and also the Ceilidh and to this end I am enclosing the booking form with this letter. As you suggested when we talked I will contact Innes Duffus to arrange payment. May I congratulate you for arousing such interest in our family name and ancestry. You have done a wonderful job and I hope a good attendance will be a rewarding experience. We are both looking forward to meeting other Duffus family members and I hope my son & his family will also be able to attend, although pressures of business & school commitments may prevent this. I look forward to hearing from you with further details which I can receive via my sons fax or email numbers shown on the enclosed form. P.S. I am enclosing an extract from my family tree for info. 1. WILLIAM1 DUFFUS was born 1761 in Pennyburn, Scotland, and died October 31, 1824. He married ELSPET SPENCE May 31, 1788. 2. i. WILLIAM2 DUFFUS, b. March 25, 1790, Pennyburn, Scotland; d. June 09, 1866.
ii. JOHN DUFFUS, b. May 07, 1794, Pennyburn, Scotland; d. September 16, 1812. 3. iii. JAMES DUFFUS, b. December 06, 1796, Pennyburn, Scotland. For revised tree click here!!! Thank you for your letter and I apologise for not replying sooner. I was consulting a colleague regarding your proposal and forgot to reply until reminded by Innes. I confirm that you will not require to apply for planning permission or listed building consent for the erection of the stone, provided that the stone is as per our discussion on site. To confirm, we agreed that the stone should be of local (or a good match) sandstone, with a simple profile and style of lettering, and of a similar size and shape to the smaller stones we looked at nearby (approx 20in high). Most importantly, the foundation should be shallow, causing minimum disruption to the ground. We looked at it being located in line with, and to the immediate north of, your family stone. I hope that this isn't too restrictive to your being able to provide a memorial to your great great grandmother that you are happy with. I feel that in conservation terms this is the best solution. It won't interfere with any of the historic fabric of the original stones, and acknowledges that intervention is possible, if it can be justified and will respect what we are trying to conserve. It will also contribute something of our time. With this in mind, I wonder if you might consider giving a little more information about the reason for the stone in your proposed inscription. Perhaps the date "2000" and / or the words "his great great grandmother" would give a more complete story to future visitors to the Howff. I trust all goes well with your arrangements for the Duffus gathering. What a fascinating and intricate website! Thanks for it and the information we received in the mail months ago in Panama regarding the Duffus reunion this summer in Scotland. Having married into a Duffus Family twenty-one years ago, I confess to being ignorant concerning my husband's (William James Duffus) heritage, as is he, unfortunately, except for recent history. I only know his grandfather,William Alexander Duffus, born in 1900, came to the U.S. from Scotland, worked at the Portsmouth Naval Shipyard in Kittery,Maine, went to the Panama Canal Zone in the 50's, and retired to FL where he died in 1969. My father-in-law,James Neithercut Duffus, was born in Maine in 1928, and has a younger brother, also a William Alexander Duffus , plus a sister,Elizabeth Duffus Bean Beard, who has a daughter, Linda Bean LaChapelle. My husband, born in Maine in '51, went with his parents, older sister Inez, and younger brother James to Panama in 1957. Except for two years in college and over a year working in Boston in the 70's, he's lived solely in Panama. Our two children,Emily Duffus and Louise Duffus, were both born and raised there until this past summer when we moved permanently to Maine, preceding the completion of the turnover of the Panama Canal. We received the Duffus Reunion mailing during a whirlwind time of preparations to leave Panama, while ending our careers there, and being involved in our Emily's high school graduation as the last valedictorian in the history of Balboa High where her Dad graduated thirty years before!!! She is now a first-year student at Bowdoin College. Her sister Louise is beginning high school here. Consequently, we had no time amidst the hecticness and emotion to appreciate the significance and scope of what you Duffuses are putting together, but you are to be commended. It is quite awesome, and since my heritage is also Scottish, (McLeod), I am personally intrigued. I doubt, however, that any of us would be able to attend, even though I'd very much like to! May all your plans fall smoothly into place. I have been reading the duffus e-mail, and was interested in the George Duffus, born 1844, who went to Jamacia to find his plantation owner cousin, who apparently had drowned with all his family. I'm forwarding your email to other family members who may have the information you are looking for. By the way, where do you live? We have it on record that Alexander Duffus, born 30 May 1741 and married to Frances Smith, went from Banff in Scotland to the West Indies and had eight children. One of the sons, Thomas, married to Susanna Gordon nee Berryman, left Jamaica about 1827 and it would appear that apart from a daughter who married a Mackenzie, there were no other Duffuses of that family who remained in Jamaica. I would be most interested if John Marten could supply any details of his forbears which may connect with the Thomas Duffus referred to or his father, John Duffus of Banff, who married Margaret Bissett on 7 July 1737. David please forward this to John. I have not got his address. James Duffus was a cousin of my great grandfather, George Duffus, most likely the relationship was not as close, he was probably a second cousin or the son of a cousin. James was married 3 times, first wife died, second was drowned with her children off Morant Bay. I am sorry but I have very little infomation about this family.I have seen their graves in Bath churchyard in St Thomas. Very handsome granite stone, they sent it out from Scotland !! This is what I have to date. Will of James Duffus ( died 1877 ) Married Fanny Passley ( 3rd marriage ) He had 3 children George, David and Emma. George was also left his father's gold watch and chain. The will is dated September13 1877, address is Stokes Hall St. Thomas. This sounds as if it could be the family John is looking for. The earliest Duffus I found in the Almanacs was in 1808 Alexander Duffus who was a judge! Then there was a Thomas Duffus in 1808 who was employed as a " collecting constable " ? what that entailed. 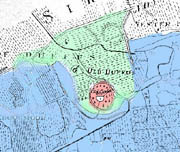 In 1815 in the district of Port Royal, Peter Duffus had a plantation of 61 acres and 12 slaves. In 1839 James Duffus was a Ensign in the Millita. ? was this James of Stokes Hall. Lastly Caroline Duffus widow of Thomas Duffus died in 1853 aged 84. What I have not yet done is to check the Mormon records I understand that these are now available for Jamaica and can be ordered to be viewed at local centres. details on the web at their site. These might help to see where all the above fit in. Herbert remembers as a very small boy being introduced to one of James's sons who was a clergyman on holiday in Jamaica from Barbados (? ) But he definately remembers the long red beard!! That would have been about 1912 - 1913. Hope the above will be of some help. Where does John Marten live ? Please find enclosed my registration form for the Reunion. We all look forward to the Reunion and to meeting you. I will pay for the Ceilidh when I see you, as it will be easier than you having to convert British cheques. All the best and thanks for your updates and your organization. 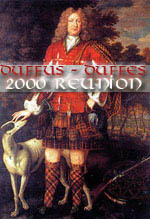 I am now enclosing my registration form for the reunion at Duffus Castle. We shall be unable to arrive until the evening of June 29th and so will join you on the morning of 30th June. Please note we wish to play golf on the Friday. Can you confirm that there is the demand for this activity in which case we will bring our clubs with us. Regarding the ceilidh I will pay you when we see you. Looking forward to this Reunion which weather permitting will I am sure will be a great success.